Fortune seeker Barry Storm stumbles onto some clues that may lead him to the fabulous Lost Dutchman Mine, but others have tried and been murdered. Blind detective Duncan Maclaine relies on his working senses to piece together an assortment of clues to solve a case of murder. The hilariously mad story of all the best things in life that are not free... and the one thing that definitely is! What surprise(s)? Plenty. How about Telly Savalas playing an effeminate guardian? How about Ricardo Montalban playing a klutz! This movie has all that and then some. 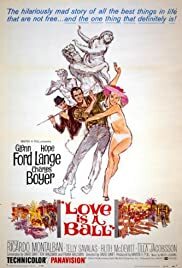 Hope Lange is perfect as the rebellious young girl who doesn't want to be stereotyped (this was pretty racy for the 50s mind you), and Glenn Ford totally disarmed by his circumstance and his company. Great chemistry between the players especially between Charles Boyer and Montalban, who just doesn't seem like he's ever going to play up to his title...this is really funny. A movie I can watch again and again.